As shown in Figure #1, static mixers are used in continuous processes where they homogenize fluids with no moving parts. Pumps or blowers are used to deliver the components to be mixed at the desired volumetric flow rates and to also supply the pressure energy required for mixing. Typical sizes of static mixers range from very small laboratory size units that fit into 3/16” diameter tubing, process piping that ranges from 1/4” Sch. 40 to over 120”-diameter and square/rectangular ducting such as 46-feet by 13-feet for power plant flue gas treatment. Figure #1: In continuous processes, inline static mixers create a homogeneous mix in a short length with no moving parts. As shown in Figure #2, a static mixer consists of individual mixing elements stacked in series. Each mixing element is oriented 90o relative to the adjacent mixing element to create homogeneous mixing in both the horizontal and vertical directions. The static mixing elements divide and recombine the feed materials so that the stream exiting the static mixer is homogeneous with regard to concentration, temperature and velocity which are equalized throughout the entire pipe cross-section. Figure #2: Homogeneity achieved with GX static mixing elements. 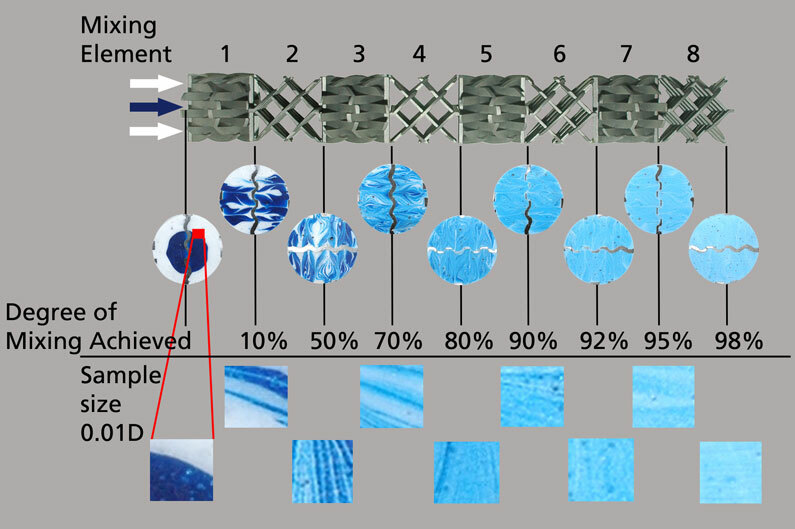 As with most process equipment, there are sometimes dramatic differences in performance between various designs. This statement also holds true for static mixers. For example, Figure #3 shows the homogeneity achieved with the Medium Performance Type HT helical static mixer which is noticeable inferior to the High Performance GX static mixer (Figure #2). Although the HT static mixer performance (Figure #3) is dramatically lower than the GX static mixer (Figure #2), the HT static mixer is still used extensively because of its lower pressure drop and open non-fouling design. Figure #3: Homogeneity achieved with HT helical static mixer.